DinghyGo Nomad S compact inflatable sailboat including kick-up rudder, sail-kit, owners manual and instruction video. Boat dimensions: - Length: 7'6" (2.30 m) - Beam: 4'8" (1.45 m) - Draft: 2'8" (0.85 m). Boat capacity (maximum): - Number of persons: 3 - Payload: 375 Kg (825 lb.) - Outboard engine: 1.9 kW (2,5 Hp). Sailing rig dimensions: - Mast length: 11'3” (3.45 m) - Boom length: 5'7" (1.75 m) - Sail area: 34 sq.ft. (3.20 m2). Packing size and weight boat: 40 x 20 x 12 in., 23 Kg (1.00 x 0.52 x 0.30 m, 51 lb.). 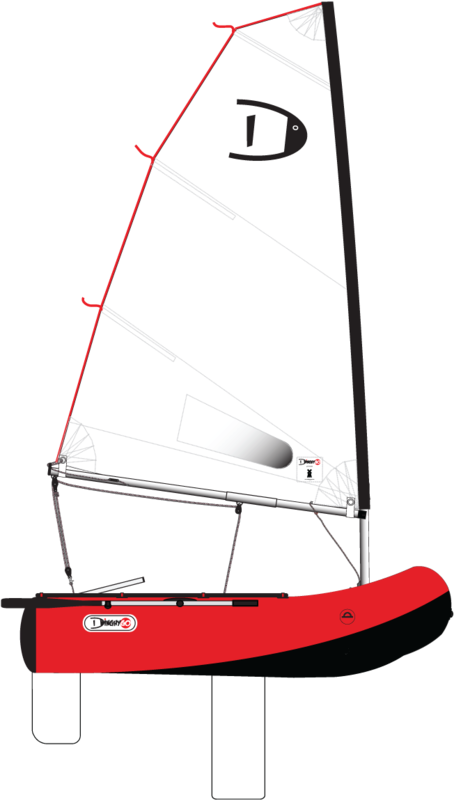 Packing size and weight sail/row-kit: 47 x 20 x 6 in., 13 Kg (1.20 x 0.50 x 0.16 m, 29 lb.). (specifications can differ by 3%; packing size and weight excluding carton/bag). Boat carton contents: - boat incl. tow & lift eyes (6) - pump - bag - repair-kit. Sail/row-kit carton contents: - thwart (removable) - oars (2) - mast step holder (removable) - daggerboard - kick-up rudder - mast (4 pieces, silver) - boom (2 pieces, silver) - sail (incl. 3 battens) - blocks & lines - bag.